Okay, technically, I suppose I can be the only one thinking this, as many of the times I claim not to be, I am. Suss THAT out for a soliloquy, Shakespeare! Anyway, take a good look at this tyyyyyooooob of toothpaste. Look closely now. There will be a quiz. Believe or not, I’m not going to freak out about the shocking omission of the Oxford comma. ….hhhhnnnngggggnnnn…. Okay, I won’t freak out *much* about that. I’m grimacing over the idea of something being ‘for’ something ‘anti’. Would this not have been better as: “whitening fluoride toothpaste that protects against plaque, gingivitis, tartar, and cavities”? And what IS the difference between plaque and tartar? Plaque causes tartar? Plaque is the Ancient Greek form of the Roman Tartar(us)? It’s all crud that ends up on the little green bib at the dentist’s. Unless the dentist drinks her lunch and forgets the bib. Then it ends up on your shirt. The plaque and/or tartar ends up in your shirt; I don’t know what the dentist does with the bib. Unless she wore it to the seafood restaurant in which she drank her lunch. I’m all for being against things, you know. I’m antilotsofstuff. I’m not sure how many Protests there are for antiracism or antiunions. There are certainly protests against racism and against unionisation…. I guess I’m just advocating for anticonvoluted language. Or, one might say, I am in support of plain language. At least in this example. Whoa. If you dote on me, does that mean I’m your antidote if we quarrel? DUDES. I AM YOUR ANTIDOTE!! I love you. And now I want to be a dentist. So I can drink my lunch and mess up people’s shirts with their own tartar. And so I can continue to use gramatically incorrect sentences. 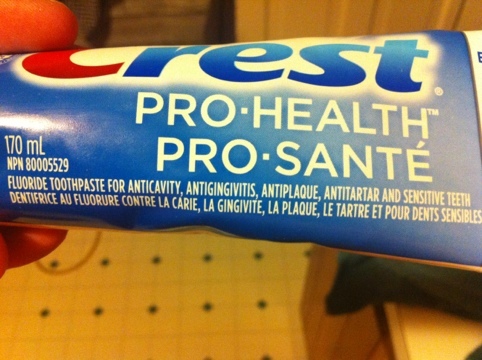 I’d just amend the order: “Antithis, antithat, antiother fluoride toothpaste for sensitive teeth.” It remains a simple descriptive fragment, taking up no more space on the tube and theoretically keeping the ad flacks happy. However, as I have been told in slightly more words, “You don’t have an MBA, so you can’t POSSIBLY understand advertising,” I might be mistaken. Oh, plaque is the living coral atop the reef of tartar. Much easier to shift, even without special anti-it toothpaste. “Deals with things your dentist shakes his fist at: plaque, tartar, gingivitis, stink, and whitening,” all in a list down the screen, making it clear that whoever was composing the list forgot that whitening was something we’re meant to think is desirable.